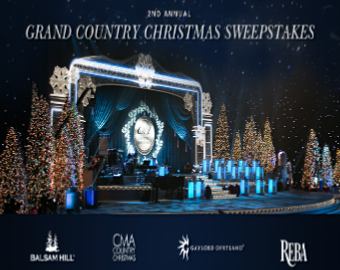 Balsam Hill 2nd Annual Grand Country Christmas Sweepstakes – Win a trip to Nashville & more! Win a trip to Nashville for the taping of the CMA Country Christmas live TV show & more! ENTER SWEEPSTAKES HERE – Balsam Hill Sweepstakes page. ENTRY LIMIT – Using Gleam, participants may earn additional entries [with a maximum of fifteen (15) entries, inclusive of the submission of the entry form]. h. (2) nights’ shared accommodation for four (4) people at Gaylord Opryland Resort & Convention Center (total approximate retail value of USD716.00). Winner must travel on the dates determined by the Sponsor in its sole discretion or the prize will be forfeited. Travel must be round trip. Winner will arrive on 9/26 and depart on 9/28 to align with show taping and they will not be eligible for other/alternate dates. Total approximate retail value of the prizes collectively is USD3,246.00.